Karagam is a most popular folk dance form of Tamil Nadu . The villagers perform this dance in praise of the rain goddess "Mari Amman" and the river goddess "Gangai Amman" as a part of their custom. In this dance, the performers balance the water pot on their head very beautifully. Kolaattam is a folk dance , very much famous in all parts of Tamil Nadu. This dance is performed by the help of sticks. A festival connected with Kolaattam has both a cultural and a religious significance. Kavadi AattamWhile visiting any pilgrimage or any such holy place, ancient Tamilians, used to carry the offerings to the gods. This used to be tied to the either end of the long stick usually made up of bamboo and then balanced on their shoulders. This was created to lessen the boredom of the long travels; kavadi Aattam hence, has its origin in this context. Many special songs were created to sing while carrying the Kavadi Sindhu. Only the men perform it, since only they can hold the Kavadi. Sometimes it is also done by balancing a pole with pots fixed on either end of stick, filled with milk or coconut water. Generally, the materials used for preparing the poles are Purasai or Teakwood. At topside of the Kavadi, bamboo strips are bent like a half-moon, covered with saffron cloth and further decorated on the sides with peacock feathers. This is mainly a religious dance, performed in worship of Tamil Lord "Muruga", who is the second son of Shiva. Pambai and Naiyandi Melam accompany the dance. Kuravanji is a type of dance-drama distinctive to the Tamils. 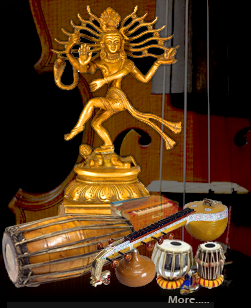 As performed for an entertaining objective, whose emphasis is balanced between the classical & traditional one. The word "Nondi" means, the one who limps and "Natakam" means play. Thus, a play performed by a character, keeping one leg folded at the back, is Nondi Natakam. This form originated during the late 17th or early 18th century in Tamil Nadu state itself. The play is a descriptive one and it is developed around two themes- devotion and forgiveness, as experienced by a one-legged thief. As a course of dance, he narrates his tale- as a thief in love with an unethical courtesan, the final redemption through devotion to God and the healing of his physical afflictions. This drama is also known as Ottraikkaal in some part of Tamil Naidu. Pavai Koothu is considered as a form of early year`s puppet shows. Some called it as a glove puppet theatre of the 16th century. "Pavai" means woman, "Koothu" means play. The name is quite appropriate to its theme, as all the stories concern with the feelings of Vali, one of Lord Shiva`s attendants, for Subramanya, who is one of Shiva`s sons. This performance uses papier-mache puppets. These puppets are generally one foot tall in height and wear paper or coconut -fiber garlands. A single person to work as manipulator is required to monitor the show. His thumb and little finger move the puppet`s arms, whereas, his middle finger works for the head. The language of the show is mostly Tamil, and the songs are predominantly folk in nature. The idakka drum and cymbals are used for music of the performance. Kai Silambu Aattam Dance This dance is performed in temples during the time of Amman festivals or Navaratri festival. The dance is in praise of all the female deities, the most preferred being the powerful angry goddess also known as Shakti -Kali or Durga. The dancers wear ankle-bells and hold anklets or Silambu in their hands. It was due to this ornament, that the dance got termed as the Kai Silambu Aattam. The participants perform various stepping styles and jumps in course of this dance. Bommalattam or Puppet shows are the most favourite dance form in Kerala, but it originated in Tamil Nadu. This dance is held in every village during the time of festivals and fairs. There are various kinds of puppets used for this show, made up of cloth, wood, leather, etc. A skilled performer with the help of strings or wires controls them. This person however, has to stand behind a screen and the puppets are held in front. The stories that are enacted in the puppet shows are from Ved-puranas, history and folklore. These shows are very entertaining and hold both adults and children quite for long time.